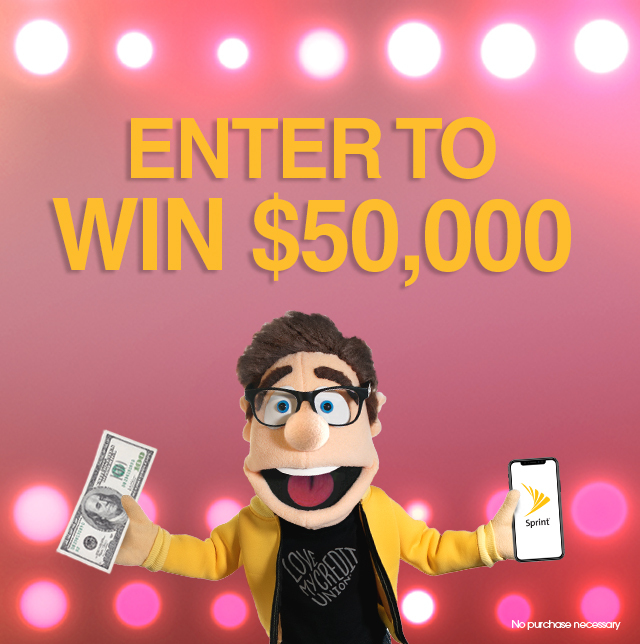 Sprint Cash Rewards is excited to invite you to enter for the chance to win $50,000! Picture the possibilities with your winnings from the sweepstakes exclusive to credit union members. Your entry qualifies you for, not one, not two, but three $50,000 prizes to be awarded monthly! That’s $150,000 in prizes, just because Sprint loves credit unions and their members. Just fill out the form below to throw your name in the hat for each of the three prize drawings. See Official Rules for details. And don’t forget Sprint also gives every credit union member $100 cash reward per line for every new line activated with Sprint, so make the switch today! Reward via deposit. Up to 15 lines. Req. registration within 30 days of activation. NO PURCHASE NECESSARY. A purchase will not increase your chances of winning. Promotion starts 4/12/19 at 8:00 AM ET and ends 6/30/19 at 4:59:59 PM ET. Sweepstakes consists of 3 Entry Periods. Open only to legal residents of the 50 United States and the District of Columbia, who are at least 18 years of age and currently employed by or a member of an eligible Company. See Official Rules for instructions on how to enter, Entry Period dates, prize details, restrictions, odds of winning, etc. Void in Puerto Rico and where prohibited by law. Sponsor: Sprint Communications Company, L.P., 6200 Sprint Pkwy, Overland Park, KS, 66251. Limited time offers. Activ. Fee: Up to $30/line. Credit approval req. Cash Reward Offers: Avail. for eligible credit union members & member employees with qualifying corp. id. (ongoing verification). $100 Cash Reward for new smartphone lines activ. Max 15. Req. activ. at point of sale. Excludes CL, MBB devices, tablets, Sprint Phone Connect, upgrs., replacements & ports made between Sprint entities or providers associated with Sprint. Limit one SWP Corp ID per Sprint acct. No add'l. discounts apply. Deposit: Cash Reward issued by CU Solutions Group. Sprint acct. must remain active and in good standing for 31 days to receive Cash Reward. Allow 6-8 wks. for Cash Reward to be deposited to your Credit Union acct. If the Cash Reward does not appear after 8 wks., visit lovemycreditunion.org/sprintrewards & click on “Cash Rewards Tracker”. Other Terms: Offer/coverage not avail. everywhere or for all phones/networks. May not be combinable with other offers. Offer, terms, restrictions, & options subject to change & may be modified, discontinued, or terminated at any time without notice. Restrictions apply. © 2019 Sprint. All rights reserved. Sprint & the logo are trademarks of Sprint. Other marks are the property of their respective owners.